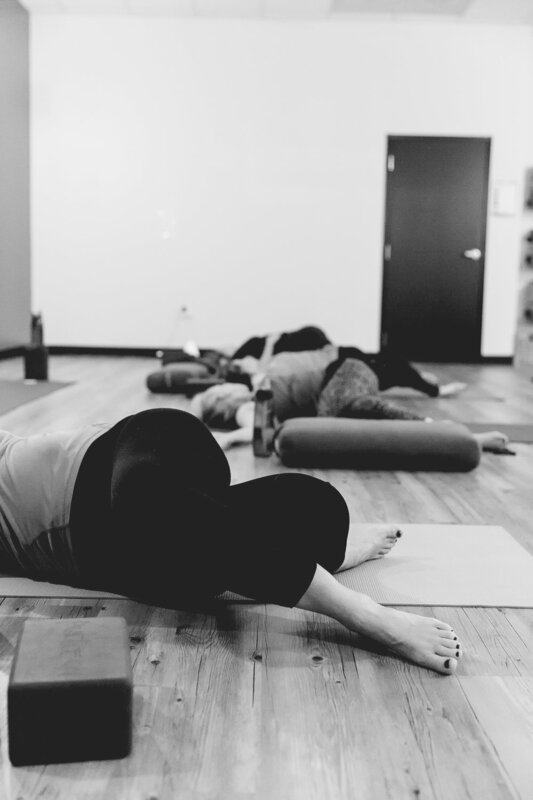 Yin Yoga is a slow-paced style of yoga with postures that are held for longer periods of time. During this practice you will increase circulation in your joints and improve your flexibility by applying moderate stress to your connective tissues. Yin Yoga is traditionally a more meditative approach and aids in bringing awareness and inner silence – which most of us desperately need in our daily lives. We can think of the main intention of Yin Yoga to be maintaining or improving the current state of heath to optimal levels. Not to be confused with Restorative Yoga which is designed to take an unhealthy body and hopefully bring it back to normal. Yin yoga can help us tap into our parasympathetic nervous system. You may have heard some of the reasons activating the parasympathetic nervous system is beneficial (stress, tension, blood pressure, sleep, digestion, immune function, hormones, etc)—and that most of us don’t do it often enough. Instead, we spend our days locked in sympathetic nervous system overdrive, constantly being pulled from one overly important deadline to another. Belly breathing can be a quick and easy way to change this. Pay close attention while breathing from the abdomen and in no time you will notice a significant shift. It may feel like a wave of relaxation washes over the body. The deepest layers of the belly soften, the forehead tingles, and the brain relaxes. It’s as if the whole body takes a prolonged sigh. As you move deeper into a yin practice, the breath slows down significantly drawing you deeper and deeper into this parasympathetic, or relaxation, mode. This is where the internal organs get a chance to catch up on their to-do list (digest, eliminate toxins, heal, repair). So, what is Yang Yoga? Yang yoga is a term used to describe the more dynamic and active forms of yoga. Ashtanga yoga, Hatha yoga, and Vinyasa yoga are specific styles that could be included as a yang practice. Yang yoga poses often emphasize strength and endurance, they are active, powerful, and generate heat in the body. The benefits of an active yoga practice can include increased fitness levels and other physical characteristics. A 2014 study in the International Journal of Yoga, for example, found that Hatha Yoga practice increased balance in young adults. It also increases mental and physical endurance. When we practice in an active asana class, we intentionally put our bodies into an intense work-out in order to find physical release. Our bodies are then tired enough to allow us to sit or lie completely still, which in turn allows the mind to also find stillness. This is what yoga is all about – being able to still our bodies, and cease our minds from wandering. For example: In Vinyasa flow yoga, the movement through a series of poses is synchronized with the inhale and exhale of the breath. Vinyasa has both mental and physical benefits. Physically, sweat expels toxins and re-energizes your body. Mentally, the synchronized breathing relaxes your mind and helps to release any blockage of energy flow throughout your body. It can be as intense or as gentle as you like. All forms of exercise can be categorized as yin or yang based on the tissues they target. Exercises that focus on muscles and blood are yang, exercises that focus on connective tissue are yin. You’ve heard it before: move it or lose it. The tissues in our bodies must all undergo stress to stay healthy. If we do not exercise our heart it will degerate, if we do not exercise our muscles they will atrophy, if we do not bend our joints they will become stiff and painful. Traditionally, yin and yang are thought of as complementary – not opposites. Thus, balancing your more physically demanding yoga practice with gentle postures can be a way to create balance and harmony.